If you walk in and are not immediately greeted, don’t be deterred or you will miss out on the food (menu here). The service is somewhat lacking (as it is many places on H Street), but the food will have you coming back for more. As a starter, try the crispy egg rolls. For $5, you get two lightly fried rolls that have a mixture of shrimp, pork, and crab meat–mostly pork. They are nicely cooked so that there is a light crunch when you bite into them, but they are not overly hard or greasy. Pho Bar and Grill also has several types of dumplings, but we have yet to try them as they have been out. restaurant’s namesake, pho ($10). 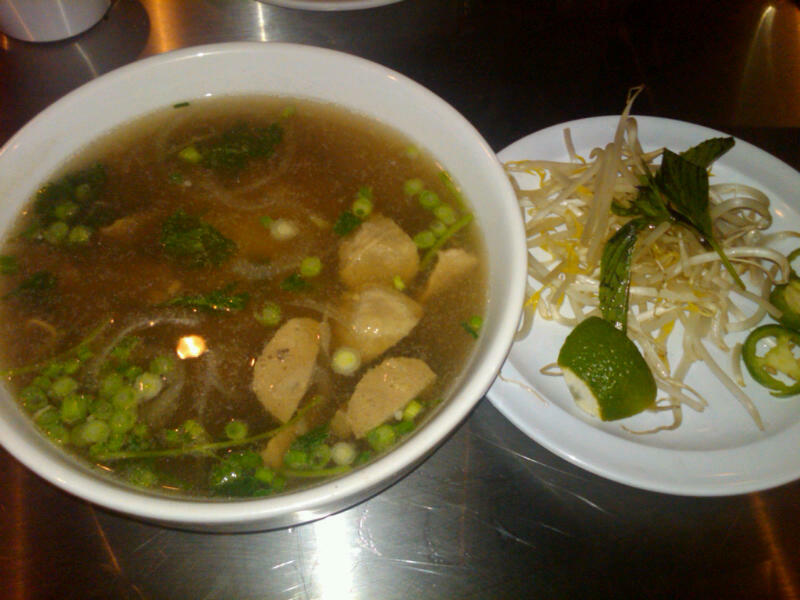 The Pho Bar Combination may be tempting because it gives you a little bit of everything, but you are better off skipping it and going with the round eye steak pho. The pho has a nice base flavor that can be improved by adding healthy amounts of the basil, lime, and chilies that they provide on the table or bring with the bowl. The steak is not as tender as we would hope, but that can be mostly overlooked by the quality of the broth and the overall taste. Avoid the meatball pho (or the combination) because you will get a bunch of very grey meatballs that have little specks of fat that are not very appetizing; the steak pho is much better. The owners have done a nice job renovating the building that used to house Sweets N Treats. The new restaurant takes up both floors of the row house that it is in and the exterior brick has been repainted. Currently the outside has a makeshift tarp sign (hopefully this will be fixed soon). The inside features long tables with tall bar stools that have the napkins, spoons, and chopsticks that you will need already on the table in large quantities. While sitting at the tables, you can watch sports or the news on the flat screen tvs. The open stairs to the second floor are on the immediate right when you walk in, and the restaurant has a nice open feel because of the very high ceilings. 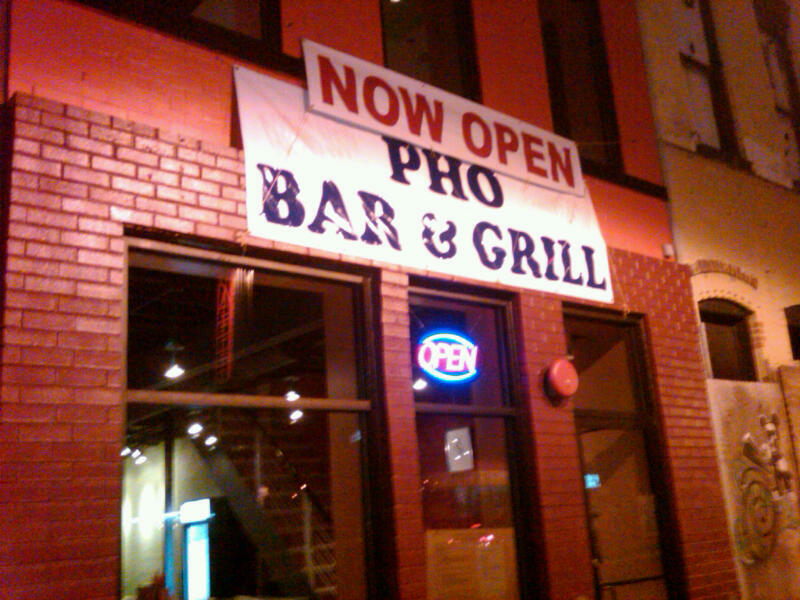 While Pho Bar and Grill currently cannot live up to the first part of its name because of its lack of a liquor license, hopefully it will successfully acquire one in the next few weeks. Overall the restaurant still has some opening issues (we hope the service improves somewhat) but has lots of promise and already has good tasting dishes. It adds yet another ethnic cuisine to the diverse H Street food scene that is cheap and quick. Several other restaurants are scheduled to open near Pho Bar and Grill on the east end of H Street in the next few months, and we can only hope that they continue to create more tasty dining options like Pho Bar and Grill has successfully done.